answer: J J Quick is listed in the 1884 & 1888 Kelly directory and the 1887 Porter directory. 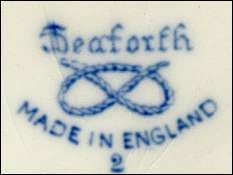 Staffordshire Knot mark with "Made in England"
answer: "Seaforth" was a pattern made by Wood & Sons. They also used a Staffordshire Knot with a crown above and "Wood & Son" below - early Wood ware had a plain Staffordshire knot. 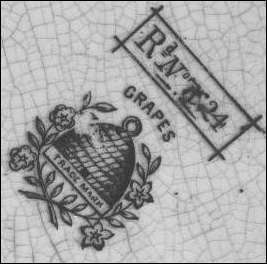 Beehive mark with "Trade Mark" unusual mark with the "circle" on top of the beehive. The Stafford knot was commonly used by North Staffordshire potters - However there is no known North Staffordshire, England with these initials. 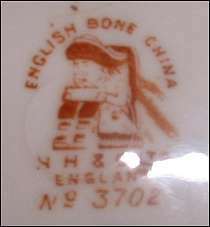 N H & Co with "ENGLISH BONE CHINA" "ENGLAND" and a toby jug logo. this mark was found on some parts of a 21 piece tea set. all the items are of the same pattern.